Flyers' forward Mike Knuble is in his third season in Philadelphia, and is becoming known around the League for his proficiency on the power play. When opportunity knocked seven seasons ago, Philadelphia Flyers forward Mike Knuble was ready. "I feel the first few years of my career, I was labeled a certain type of player," Knuble told NHL.com. "I was told I could do this but couldn't do that, but I think I've changed those perceptions the last few years." Today, Knuble is regarded as a hard-working power-play specialist. He finished tied for eighth in the League with a career-high 15 power-play goals, and his 29 goals resulted in his fifth straight 20-goal season. He's undoubtedly become much more than a player just taking up space on the third line. "I try to have a good rapport with everyone, whether it's older guys or younger guys," Knuble said. "It's just a matter of talking to everyone on their level. We have guys who wear the C and A on their jerseys, and my personality is to be a little more subtle. Sometimes you need some Indians doing the talking instead of the Chiefs all the time. You need those guys who are the go-betweens and I feel I'm somewhere in the middle." Knuble was a fourth-round pick (No. 76 overall) by the Detroit Red Wings in 1991, but remained at the University of Michigan for four seasons despite the fact he could have joined Detroit's American Hockey League affiliate, the Adirondack Red Wings, after his junior year. "I had a chance to come out after my junior season but Detroit was doing very well and I really couldn't see myself going to Glens Falls (N.Y.) when my entire life was back in Ann Arbor, Michigan. Mentally, it would have been too difficult and probably not worth the price of development. At the University, at least I knew I would get a chance to play all the time. I didn't want to be in a situation where I would be stuck in the minors and wondering 'what if.' I did it the way I wanted to and was willing to accept whatever consequences." Knuble made his professional debut in the 1995 Calder Cup playoffs with Adirondack, spending the entire 1995-96 season and most of the following campaign with the AHL franchise. His big break came in 1997-98, when he played in 53 games for Detroit. He also had his named engraved on the Stanley Cup following Detroit's second straight championship that season. 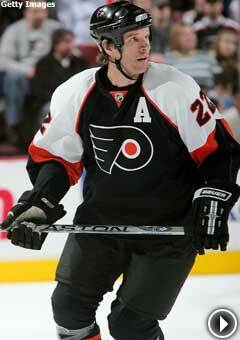 Days before the start of the 1998-99 season, he was dealt to the New York Rangers. A season-and-a-half later, the Rangers moved him to Boston. It was during the 2002-03 season that he found himself playing left wing on a line in Boston with Joe Thornton and Glen Murray. The trio clicked immediately, with Knuble finishing third on the team with 59 points, including a then career-high 30 goals. The experience playing alongside Thornton and Murray was invaluable and, in some ways, presented Knuble a new identity. "Because of injuries to other forwards, I had an opportunity to play with Joe (Thornton) and Glen (Murray), who are both great players, and we really connected well," Knuble recalled. "Needless to say, Joe and Glen each played a huge part in defining my career." Knuble signed with the Flyers on July 3, 2004, one day before his birthday and, following the NHL lockout, was slotted onto the right wing on a line with Peter Forsberg and Simon Gagne in 2005-06. He responded with career highs in goals (34), assists (31), points (65) and plus/minus rating (plus-25) in 82 games. "As big an influence as Thornton and Murray were in Boston, the same holds true for Simon Gagne and Peter Forsberg in Philly," Knuble admitted. "I'll always be indebted to those guys." While some may consider Knuble more of a complement to a good line than a catalyst, there's no denying the fact he also played a big role in the offensive careers of his Philadelphia linemates. For instance, in 2005-06, Gagne had career highs in goals (47) and points (79), while Forsberg produced his highest point total (75) since the 2002-03 season. The Flyers' power play, ranked second in the League this season behind Montreal at 21.8-percent efficiency, has 12 players with at least 10 points with the man advantage; Knuble was third with 30 points. "The puck has been hitting me a lot and we have great shooters," Knuble said. "Mike Richards and Kimmo Timonen have been there all year and (Daniel Briere) has done a nice job of running the power play. It's been tough without Gagne (concussion) in the lineup, but Vinny Prospal has really picked up the slack for us. We've been so consistent as a group and I think we're pretty proud of that. It's a big reason why we're in the position we are right now."